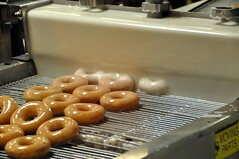 $1.65M is what it cost Krispy Kreme to settle their fight with Fairfax County over sewer pipes that were corroded by the factory’s outbound donut grease. The Lorton factory was pumping out 8% grease in their sewage pipes, which weren’t meant to take that sort of waste. While Krispy Kreme suggested that the county’s sewers should’ve been using corrosion resistant PVC instead of iron, the whole thing’s moot now. Fairfax had been asking for $1.8M in repairs and $18M in civil penalties. Now just imagine what all that grease does to your colon. If I were them, I’d try to sweep this one under the rug, before people start to make the sewer artery to vascular artery connection. They got off easy with $1.65m and a quick settlement. The city could have extorted twice that by threatening to call the attention of nationwide press to the greasiness of the production of this food. Most all restaurants use some type of oils to cook their frys, burgers, steaks, chicken, fish etc., so Krispy is not the only one using this type of product to prepare foods. Most modern cities do use PVC pipes as drainage systems, so Krispy is correct in their perspective. I’ll bet the city replaces the corroded pipes with PVC instead of the current iron. Bottom line is Krispy will be helping the city upgrade it sewer pipe system. There are companies out there that take used cooking grease and turn it into biodiesel. Cleaner fuel, cleaner pipes – a win, win. Hey Mel – you dumbass, no one forces people to eat Krispy Kreme donuts. I don’t think there is any secret that they are greasy. But you’re right, they should sweep this under the rug before the word is out (sarcasm). Thanks for the insight. John, perhaps you’d like to read our comment policy? There was no need to call Mel a dumbass there. Donna, that is exactly what responsible companies do – contract for grease removal. However, Krispy Kreme’s stock and trade is grease, so I cannot imagine how much grease they have and how they might store it. All this makes me glad to not be in that world. Too much greasy headache. I worked at Taco Bell for a while and we had a giant tub of grease by the dumpster that would get picked up by some company. It was one of the most foul things I have ever seen or smelled. John, be nice. Would your mother approve of you talking that way to other people?